If you’re using an ornament in your swag, hot glue the top on so it will not come loose when attaching it to your arrangement. Choose which picks you would like to use as your Christmas Lantern Swag base. I like to use one that is longer (one that points to the bottom) and one that is shorter (pointing to the top). Next, add in the fun picks you want to use (in mine, I used the peppermint candy picks, tinsel, etc). You can work on each side separately if that is easier for you. Zip tie the two sides together by adding a zip tie in the middle. If you worked on both sides separately, you will want to zip tie each side separately and then add one zip tie to the center. Be sure to leave enough room for your bow, I leave about the size of my fist in the middle. Trim the excess off the zip tie using wire cutters or scissors. Now it’s time to work on the bow. For this lantern swag I used my technique called the Funky Bow. For detailed instructions, visit my how to video here. Attach the bow to the swag. 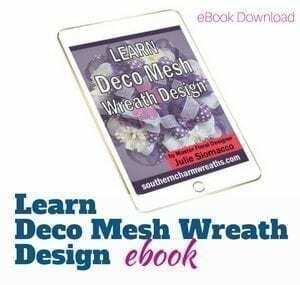 The wire should straddle the stems and then twist around in the back of the arrangement. Next, use your wire cutters to trim off any extra stems sticking out in the back. For a professional finish, cover the back wire etc. by applying leaves with hot glue. Tip: I keep all of my extra leaves and stems when I trim excess off of arrangements and use these for this step. If you would like to ensure parts of your bow stay in place, simply apply a small bead of hot glue to adhere the ribbon pieces to the arrangement. Use the rustic wire to attach your swag to the lantern. Cut a piece of the wire (I used approximately 23 inches of wire) and thread it through the top half of the swag. Next, wrap the wire around the top lip of the lantern. Your arrangement should now be laying vertical on the lantern. It is time to start maneuvering the swag into position. Bend the bottom of the swag downward and move around any of the candy picks etc. to give the swag more dimension. Don’t be scared, it’s just wire and will bend with a little man handling. 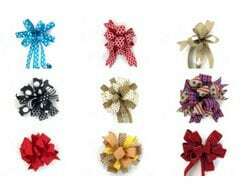 Make sure your bow is facing up and all decorations are fluffed and not flat. You can now add more items to the bow and any other area that looks bare. For my swag, I added more of the tinsel pick to the bow. To do this, I first cut the stems from the pick, placed each stem where I wanted it and then hot glued it in place. Remember, you always want to place your items and try them out first, then glue last! Don’t forget to decorate the inside of the lantern! Add a battery-operated candle, some ornaments, greenery, whatever you would like. Just remember not to burn a real candle in the lantern as the heat from the candle is a hazard with the swag on the top. 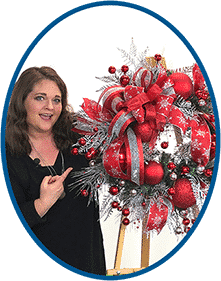 In the video I mentioned my new membership club – the Wreath Making of the Month club! For more information, click here. 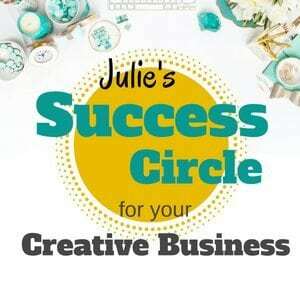 I hope you will join me for this new exciting adventure where I teach you to make a new wreath once a month online from the comfort of your home! Make sure to comment below and tell me if you like it so that I know to keep making more tutorials like this. Don’t forget to share this with your friends! 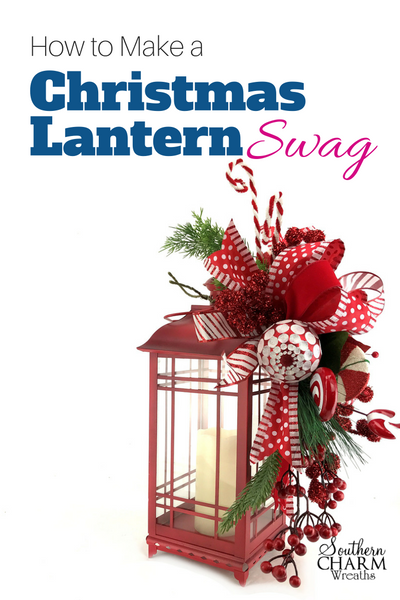 I made a Lantern swag for Christmas but it is not half as pretty as yours! Thank you for taking the time to be a perfectionist! You are so talented. I am taking mine apart & following you on the tutorial Thanks for being there for me! Hugs Pat from Ohio. Your videos are delightful and easy to follow. The lantern swag is gorgeous! Your talent is immense! This Lantern Swag is just so gorgeous! Thanks for sharing your talents with us! Many blessings to you and your family during this holiday season! 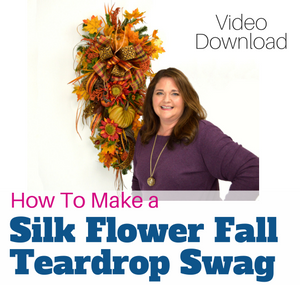 I purchased your fall swag video among others and it was in 4 parts. I saved it but now I can’t find the pass word to open it. Please advise. What a fantastic idea for a lantern. I’m from chilly Washington State (23 degrees). Thank you for the video, enjoyed listening to you and see how you did this. love your artistic flair, you make it look possible for anyone to achieve, will definitely be trying this one. Thank you for sharing, happy thanksgiving to you and your family.